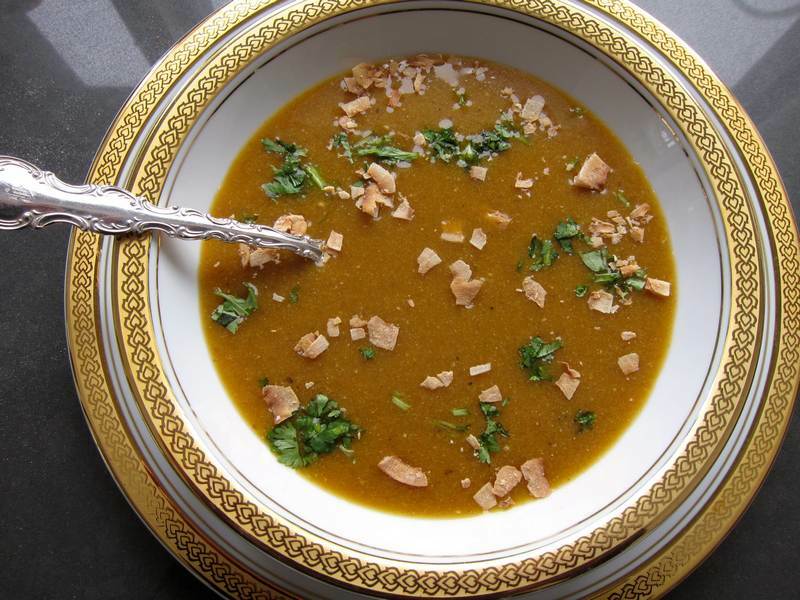 Curried Butternut Squash Soup – Something Bright and Beautiful! I can hardly wait for March. Spring will be a relief, but the new film, “The Best Exotic Marigold Hotel“, looks fantastic. Director John Madden engaged Tom Wilkinson, Maggie Smith, Judi Dench, Bill Nighy and Dev Patel to star in a comedy about British retirees who move to India to live out their golden years and find that their new home is a dilapidated hotel. I don’t know about you, but I dream about growing old gracefully in colourful, lively, soulful, fragrant, exotic India. On that note, how about some curry flavour? In a large soup pot, heat the oil, medium hot. Add onion, shallot, garlic, ginger and curry powder, cooking until aromatic, about 5 minutes. Add mirin, and cook down until reduced by half. 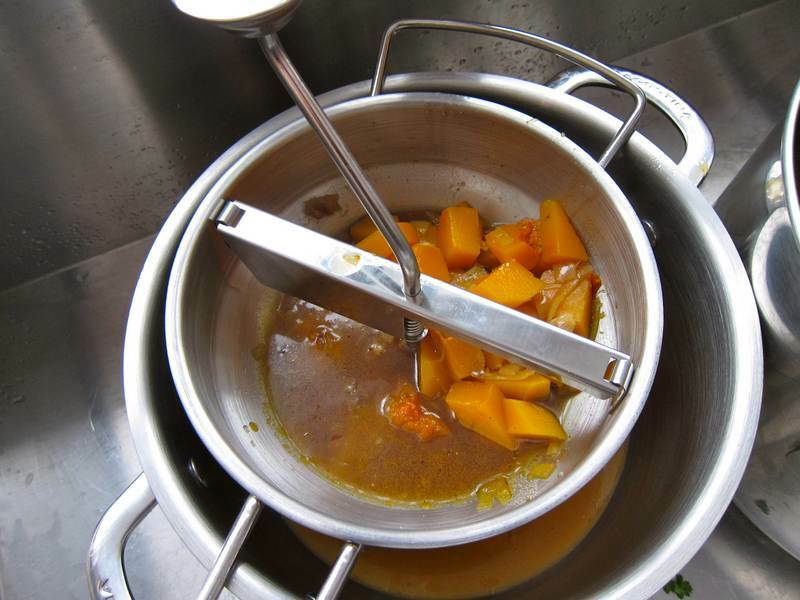 Add stock and squash, bringing to a boil, then reduce the heat to low, and simmer, covered, until the squash is soft, about 15-20 minutes. Remove from the heat, and purée until smooth. A food mill was used to grind the vegetables into a velvety smooth consistency without being too thick. 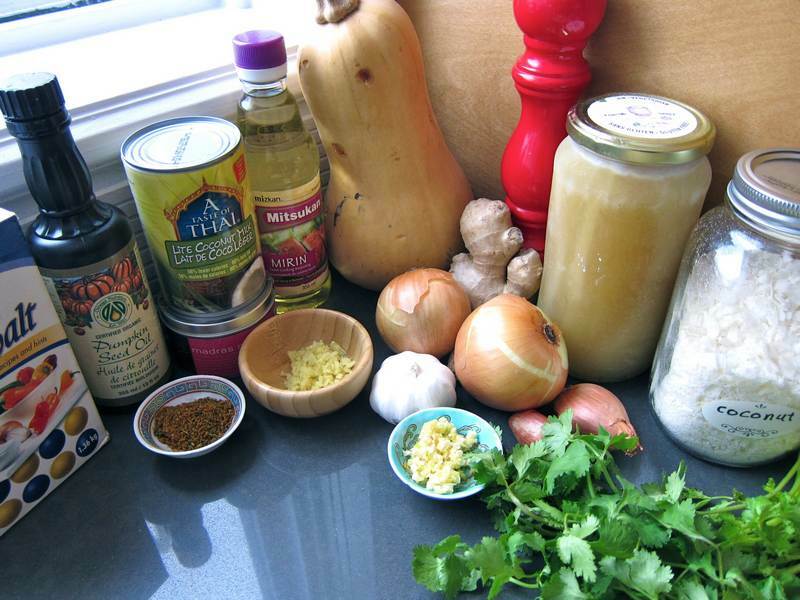 Return the soup to a pot, add coconut milk, heat, salt and pepper, then garnish with cilantro and coconut. To support those who don’t have the option of retiring in India, give generously to Maimonides and to yourself, by purchasing their “Cooking with Love” fundraiser cookbook, from which this recipe was plucked, with permission of course. Thank you to Liz Joffe for encouraging me to get a food mill. It adds a refreshingly new possibility to soup texture. This soup tasted even better the second day after all the flavours had more time to marry. this looks so good; can’t wait to try it! I love how you put all the ingredients out – makes it easier to visualize actually going through the process of making it. Will be picking these things up during my next shop! Thanks Monica. I do like the idea of being able to eyeball the ingredients before starting out. Hope you try out lots of the Jittery posts. Let me know how it goes. I make a similar soup but at the end add a can of chickpeas making it a complete meal. I do not use coconut milk, but I will try it next week. Do you leave the chickpeas whole? Sounds good! I wonder if the dry ones we cook ourselves taste different from the canned. Where did you get your food mill? I love mine but it is ancient. It was my Mom’s – she used it for making chopped liver (which I would never make) and applesauce (which I make constantly in season). C’est tout! Makes the best sweet pink healthy applesauce! Thanks for inspiring me to make this soup yesterday. Yummy. I added one red chili pepper and omitted the coconut milk. thanks, and I’m looking forward to other goodness from your kitchen.